Decade after decade Stevie Wonder has accustomed us to extraordinary live performances. Their concerts from the wonderful albums of the 70s, his Natural Wonder from the 90s, the Live Live At Last of this century, which gave an overview of his incredible musical legacy and inegualable treasures, and more recently their concert from Rock In Rio. One such musical delicatesem corresponds to one of the many special guest at The White House, the official residence and principal place from which to runs the country the President of the United States, Barack Obama. One more time there, like a pressure cooker about to explode, the only way to escape are the notes of music arising from the interpretation impressive with the trumpet of Arturo Sandoval, and of course, the wonderful and always nuanced voice of Stevie Wonder. Defying the laws of nature, the time slowed down to stop for a moment at the White House. Those were times when a nebula of warm and emotional sound sensations, wrapped all present at the exquisite and majestic rendition in his interpretation with a song full of magic and beautiful. 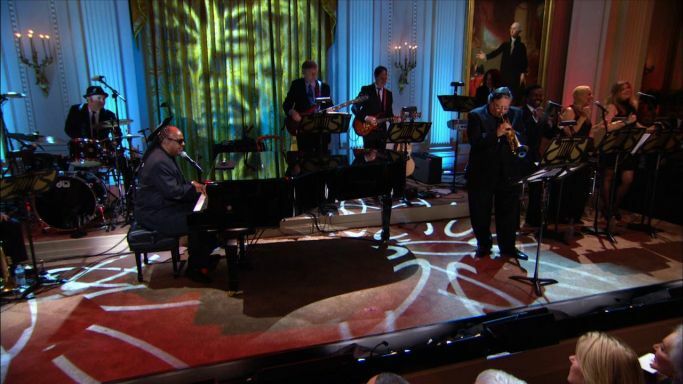 “Make It Easy on Yourself”, It was in the East Room (year 2012) to tribute Hal David and Burt Bacharach as part of the "In Performance at the White House: Burt Bacharach & Hal David: The Library of Congress Gershwin Prize for Popular Song, Stevie shows us why he's a genius and a living legend of the music of our time.